Parties at Flour Power bring smiles and cheers, to both parents and children! We do the work so you can enjoy your Lil' Chefs big smile! From the cupcakes to the invites to leading all the fun, we handle all the details so your only job is to have fun! We have one package that includes EVERYTHING to keep it all simple! Ages 3 to Teens! As parents, we look for educational opportunities to delight their senses and stretch their imaginations... As kids, we look for programs that are FUN! Bring your Lil' Chef over and you'll pick up a newly self-confident child who will beg to cook dinner for you! Join our Flour Power family, be your own boss, and make a positive impact in your community! Click below to learn more about our franchise opportunities now available throughout the United States! We can't wait to talk with you soon! Preschool to Teens! Our themed weekly classes are a fun way for your lil' chef to focus on hands-on cooking class sessions while learning recipes to try at home. From Preschool Chef to Teen Chef, we stir up a ton of fun all year in all of our studio locations! Choose the set of classes that fit best for your schedule and have months to use them! Etiquette: Good Manners for Good Children! Etiquette: Good Manners for Good Children! Back to the Basics! From the importance of hand written notes to making eye contact and working on voice projection, we learn the basics in a friendly and fun way! Special Events: Upcoming One-Of-A-Kind Events! Find all of our one-of-a-kind special events here! From Special Needs classes to family events, the fun never ends at Flour Power! NEW: Adult Cooking Classes at Flour Power! Bring a friend, or create new ones in our hands on relaxed, fun filled evening classes for adults. Bring your own beer or bottle of wine, and sip n stir the night away with us at Flour Power! We can't wait to meet you soon! Kids Night Out: Date Night For You! Kids Night Out Most Fridays 6 - 8 pm! We'll stir up a ton of fun in this hands on two hour class and dinner is included! We can't wait to see you soon! 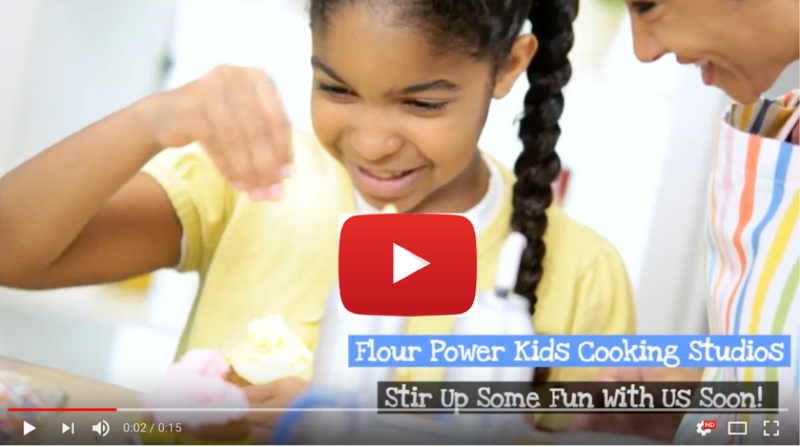 See what people are saying about Flour Power Kids Cooking Studios! Check out our short video to see how we stir up a ton of fun! We can't wait to meet you and your Lil' Chef soon! Learn more about Flour Power in this short 15 second video! Interested in owning your own Flour Power Kid's Cooking Studio Franchise? Chances are, if you've found yourself on this page, you've always had that nagging feeling of wanting to be your own boss and own your own business. Joining a franchise team can be a life-changing experience filled with many rewards. Flour Power and our franchisees make a unique team and provide an opportunity to help shape lives of our future leaders!